Rod Laver Arena – Wikimedia Commons, the free media repository. Retrieved 00:02, February 8, 2019 from https://commons.wikimedia.org/w/index.php?title=File:Rod_Laver_Arena_(8984015851).jpg&oldid=274462588. The Australian Open, the first grand slam tennis tournament of the year, is one of the most festive and exciting tennis tournaments in the world. Representing the Pacific – Australia and Asia – many fans around the world come to get a taste of what it’s like to endure the Aussie heat. Because it’s the first major tournament, many upsets are likely to happen. The top players, such as Serena Williams and Roger Federer, may not be in as good of form as some of the lower ranked players because they play at most one tournament before the Australian Open. 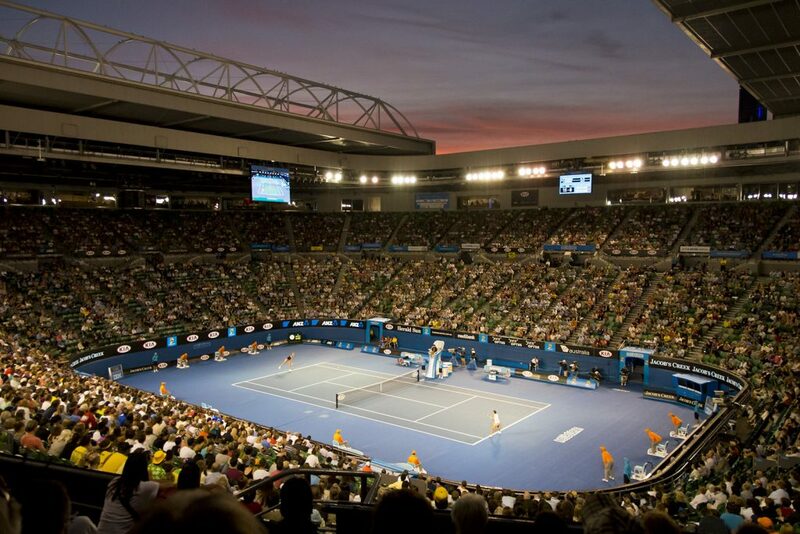 This years’ Australian Open did not disappoint in the shocking upsets and dramatic matches that took place. The first week, per usual, is dominated by the top players, sweeping their lower ranked compatriots aside like a broom to some dust. Novak Djokovic – the current world #1 – dismantled Mitchell Krueger (USA) in the first round, and eventually rolled past Jo-Wilfried Tsonga (France), a former top 10-player. Roger Federer, a former world No.1 and 20-time major champion, struggled in his first week matches – notably defeating beating Dan Evans (GBR) and Taylor Fritz (USA) in straight sets but having to do them in tight sets. Rafael Nadal – another former world No.1 and 17-time major winner – had a fairly easy route throughout his first week, winning every match in straight sets and not losing more than five games in per set. In the women’s draw, Serena Williams was in form the whole first week, winning all of her matches in straight sets and losing no more than two games per set. Another impressive woman throughout the first week was Maria Sharapova. In form, she destroyed her first two opponents dropping four games in total the first two rounds. Sharapova then met the defending champion, world No.3, Caroline Wozniacki, who also seemed in great form for the tournament. The battle went three sets with Sharapova prevailing as the winner, stating that she is ready to be a contender for major titles once again. Another woman who was playing some world class tennis the first week was Naomi Osaka, infamously known for beating Serena Williams at the US Open last year when all of the drama took place. Osaka was on a mission to prove that she was not just a one hit wonder and breezed through her opening matches. As the tournament progressed, the upsets began to emerge and made the tournament draws more interesting. Serena Williams, the heavy favorite for the title, played Simona Halep, the No.1 seed at the tournament, in the Round of 16. Serena upset the No.1 seed by defeating Halep in a hard fought 3-set match, winning 6-1, 4-6, 6-4. However, Serena’s next opponent was a former foe that defeated her three years ago at the US Open semifinals: Karolina Pliskova. Pliskova, a former world No.1 and one-time major finalist, seemed to be in total control of the match until Serena came storming back, winning the second set and leading 5-1 in the third. However, Pliskova kept her head in the match, saving match points and prevailing as the winner in the three set marathon match 6-4, 4-6, 7-5. Another shocking upset was Danielle Collins absolutely destroying the former world No.1 and two-time major champion, Angie Kerber. Collins, from the United States, brought the hammer down on Kerber, winning 6-0, 6-2. She made it to the semifinals, eventually losing to Petra Kvitova. Though those upsets were extremely shocking to fans, the biggest upset of the tournament by far was Roger Federer going out in the Round of 16 to the promising teenager from Greece, Stefanos Tsitsipas 6-7(11), 7-6(3), 7-5, 7-6(5). The match was intense and had the crowd on their feet with the high quality points being played. Still, Federer’s resilience was waning, and the youngster was gaining confidence towards the end of the match and was able to close the match in style. The battle shocked the tennis world and allowed for Tsitsipas to gain respect, not only his fellow players, but from the fans around the world. Though both of the draws had upsets that shocked the world and allowed for opportunities for new players to emerge and win their first grand slam title, both finals had the favorites in it. For the women, Osaka played Kvitova for the title. The final was intense battle that went three sets and spanned over two hours and 27 minutes. Both had won majors at this point in their tennis career’s – Kvitova-2 and Osaka-1 –, so the pressure of winning their first one or being in a stressful situation was not present throughout this high quality match. Though Kvitova fought with all she had in her, Osaka prevailed as the winner, winning her second grand slam and becoming the new world No.1. This marks an even greater milestone for the young tennis superstar. Not only is Osaka the first Japanese player – male or female – to win multiple majors, but she is now the first Japanese player to reach the world No.1 position. The tennis world is excited to see what she will bring in her coming years, as well as how far she can go in breaking records and setting milestones for others, especially Japanese players. The men’s final consisted of two old rivals that have played in many major finals before: Djokovic vs. Nadal. The two had played the Australian Open final before and the match is infamous for being the longest major final ever. This match was dominated by Djokovic, which contrasts every other match they had played before. Djokovic was once again in peak form and not even the “Spanish Bull” was able to take him down. The match was shorter than the women’s final, lasting just two hours and four minutes and had Djokovic control the scoreboard, winning 6-3, 6-2, 6-3. This now adds to Djokovic’s ever growing major count, sitting pretty at 15. This year’s Australian Open proved to be one of the most memorable and interesting Australian Opens ever played. The upsets, the emerges of the new generation and the matches played made for a hell of a tournament.